Timeless elegance with a modern cut, this tailored fit white shirt from Moss 1851 would make a worthy addition to any wardrobe. 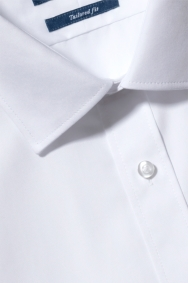 Making use of a contemporary, close-fitting style, this tailored fit shirt comes with single cuffs and a regular collar for total wearability. Paired with a silk tie it's perfect for the office, while unbuttoned it remains an attractive option for hot summer days and nights on the town. Wear with any Moss 1851 tailored fit suit and a vivid, block colour tie to steal the limelight at your next big event. Great fit, fantastic material quality. As before just what I was looking for. Quality and price under one roof. The long versions of the procured shirts fitted well - but being a long version an extra button at the bottom of the front flap would be appreciated. Fits very well and it’s very comfy!! Nice shirt, fits well couple of loose ends. Didn’t think it would iron as well as it did but it looks good. More than excellent fit and excellent value. It is a simple but good quality shirt. The only negative is that the sleeves are longer than usual / expected. Shirt not easy iron and creases to easily. Shirt was marked when bought. Different prices in different shops for the jackets, thought pricing structure would be same throughout company. Good formal shirt at a great price. Very satisfied ! Will return ! Lovely shirt but too small. Shirts fitted very well, the assistant made sure I had the correctly fitting shirt for my measurements. Just price.i thought £30 was a lot but then i dont buy them often? Very good smart looking and good quality. Shirt fits perfectly (good quality). Good quality, nice everyday shirt. Amazing look for my handsome young son! Great quality shirt. Washed and ironed well. Very hard to iron, creases very easily and visibly not as good as my other shirts. Not the worst but not on parr with the others. barring in mind they cost the same. 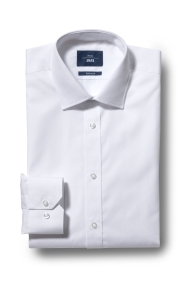 I have a slim body and was having challenges getting shirts that fit me.The moss extra slim fit are perfect for me. Great long sleeve shirt although the shirt isn't a true slim fit and is slightly baggy around the chest and shoulders. Good fit and good quality. Great fit and style. Will definitely order again! The quality of the product spectacular.Once again thank you Moss Bros. Very well tailored shirts, comfy and modern styling. Material felt smooth and hung well when worn. Love the shirt overall, crisp white and fits like a glove. Next will be to try one of your suits! Very nice in fit and with OK quality. Nice fitted shirt. Exactly what I wanted. Very happy with shirts as I have a big neck but wanted tailored fit.